Retired journalist Tom Davison is researching the history of Sutherland House in Ceres. A newcomer to Ceres has written a history of the house he now calls home. But there’s one chapter in the story of Sutherland House that Tom Davison has yet to write – the part covering the Second World War years. Tom, a retired journalist who moved to Ceres from the Highlands last year, has used contemporary articles from the Fife Herald and St Andrews Citizen, as well as documents from the Fife Cultural Trust archives, to piece together the history of Sutherland House, a substantial Victorian property on Wemysshall Road. The house has had many uses in its 143-year history and, although Tom has found a wealth of material covering much of the property’s past, he has found virtually nothing about what it was used for from 1939 to 1945. He said: “I’ve read fleeting references to it serving as billets for troops during the Second World War, and I’ve heard that Polish troops were accommodated in the house. Sutherland House was opened as the Adamson Institute – the forerunner to the Adamson Hospital in Cupar – in 1875. 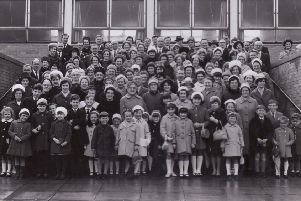 However, money problems forced the hospital’s closure just eight years later and the building was subsequently used for 35 years as a holiday home for impoverished children from Leith. It also served as a Red Cross hospital during the First World War. Prior to Sutherland House being converted into flats in 2005, it was known as Alwyn House and was run as a training establishment for the blind. Tom added that once he has filled in the wartime gap in the fascinating story of one of Ceres’ largest properties he plans to get the history published. “It’s not just the largely untold story of a building,” he said. “It’s a story that sheds a light on the social history of Ceres and the surrounding area.